The eye test is the one health test that has to be repeated annually and I'm pleased to say that Annie passed her today. The results are notoriously slow to show on the Kennel Club health test results database so I always email a copy direct to them, rather than waiting. I had booked Annie an appointment at the vets for tomorrow, planning to do the progesterone test and have the first Herpes vaccination given. However, I can tell from her body language that she's nowhere near ready for mating yet, so the appointment has been cancelled and one booked for Monday instead. 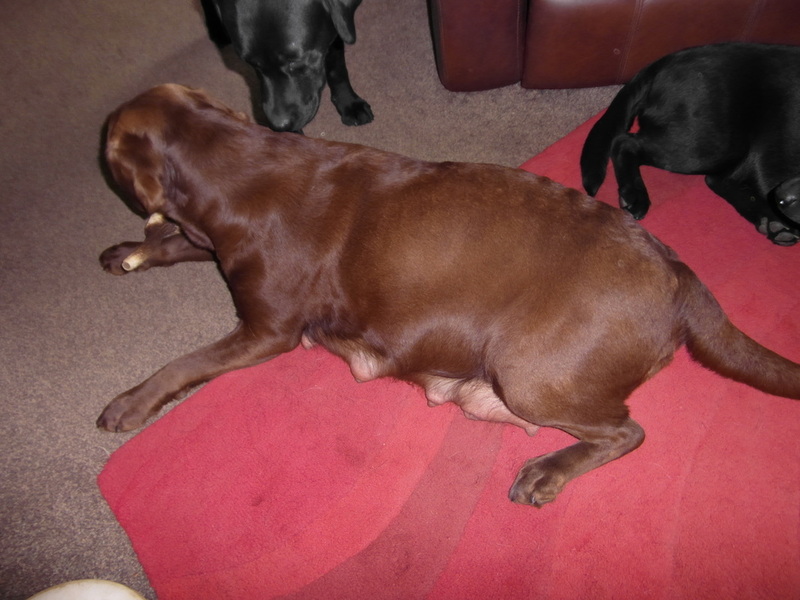 Despite behaving like a total tart and flirting like mad with the boys, Annie's progesterone levels are still too low. I'll be re-testing on Thursday, fingers crossed the results will show she's ovulated. She has, however, had her first Herpes vaccination. Annie’s progesterone levels had gone through the roof so we’ve visited the stud dog and had the first mating. I would normally have the 2nd mating 48hrs later but on this occasion that time gap will be too long, so we’re going back again tomorrow morning. 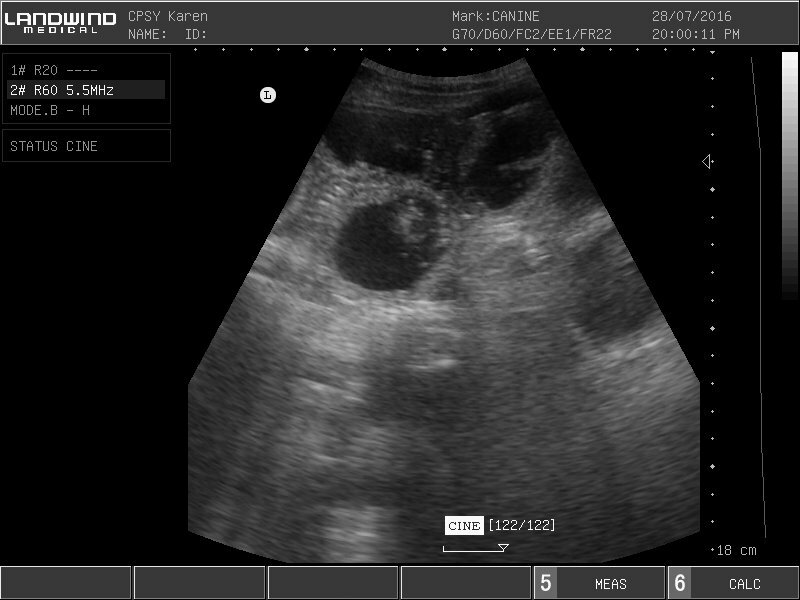 I’ll be getting her scanned at around 4½-5weeks and all being well, we should have a litter of puppies due on or around 25 August. Annie's had her 2nd mating this morning. Now we all have to sit back and wait. The plan had been to get Annie scanned on Monday 25 July, but unfortunately events conspired against me. She's now booked for tomorrow evening and as soon as we get back I will update this page. My apologies to those of you who have been eagerly awaiting an update. Annie is most definitely pregnant! Annie is noticeably pregnant now and her trim waist has disappeared. Here are a couple of photos of her, taken today. Click on each one to see the larger image. Preparations are in hand for the birth of Annie's puppies. The whelping box has been steam cleaned and will be put together in the next few hours. The vet bed is washed and ready for use and the puppy ID collars selected. 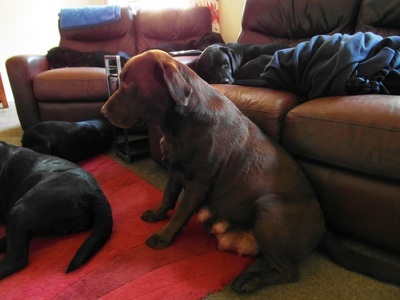 Annie is quite big now and her tummy very taut, stretching to hold all the puppies. This evening I could feel them moving as put my hand on her, such a lovely experience. Annie's pups are here! A litter of black and chocolate puppies - though Mother Nature stuck two fingers up at the statistics which say the litter should be 50/50 black and chocolate. They have their own page now, so you'll be able to watch their progress over the coming weeks.